Pennsylvania’s marketed natural gas production averaged a record 15 billion cubic feet per day (Bcf/d) in 2017, 3% higher than the 2016 level. This production is largely from shale plays in the Appalachian Basin. Pennsylvania accounted for 19% of total U.S. marketed natural gas production in 2017 and produced more natural gas than any other state except Texas. Pennsylvania has experienced an increase in permitting and drilling activity with the expansion of regional pipeline capacity capable of moving natural gas to market centers outside of production areas. According to the Pennsylvania Department of Environmental Protection, the state issued 1,352 natural gas drilling permits in 2016 and another 2,038 in 2017. The drilling rig count in the state has also increased, averaging 20 rigs in 2016 and 33 in 2017, based on data from Baker Hughes. Recent permitting and drilling activity in Pennsylvania is concentrated in opposite corners of the state. Washington and Greene counties in southwestern Pennsylvania and Susquehanna County in northeastern Pennsylvania have the highest number of permits and rigs. Natural gas produced in Washington and Greene counties has a high natural gas plant liquid (NGPL) content, enhancing the value of gas extracted from these counties and helping drive production. NGPLs have tended to sell at a higher price than the natural gas. By comparison, natural gas production in Susquehanna County is relatively dry, meaning the natural gas has less NGPL content. In Susquehanna County, the estimated ultimate recovery of wells—a measure of gas productivity—has increased over the past five years, spurring further drilling activity. In 2016 and 2017, these three counties combined accounted for slightly more than half of the total permits and two-thirds of the active rigs in Pennsylvania. In the past, natural gas production in Pennsylvania outpaced the ability of regional infrastructure to process and transport it out of the region. Several pipeline projects in recent years have alleviated these constraints. 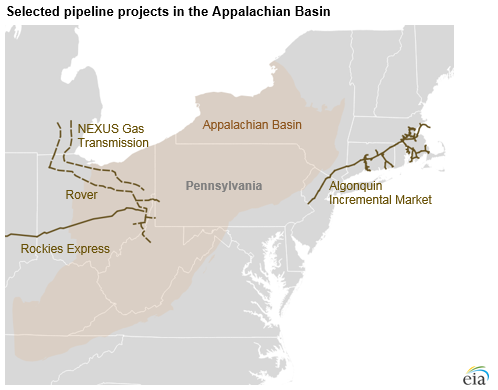 These projects include: the Rockies Express Zone 3 expansion, which entered into service in October 2016 and moves natural gas westward from southwest Pennsylvania, and the Algonquin Incremental Market pipeline, which entered into service in December 2016 and primarily moves natural gas from northeastern Pennsylvania into New England.